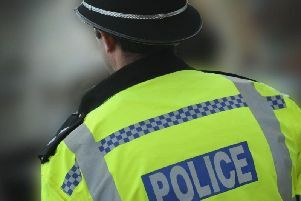 A police suspect wearing a fluorescent pink dressing gown pretended not to be at home when police came calling. The person failed to answer the door but was spotted through a window wearing the colourful night attire. Crawley Police tweeted a picture of a door ram (see above) at 1.07am yesterday (Tuesday September 11) and wrote: “Pretending you’re not home when we can see you through the window wearing a fluorescent pink dressing gown is a poor decision when you’re on the run!